" ... an absorbing evening of theatre which made you sing, laugh and cry ... loved the way it was presented. Highly original." 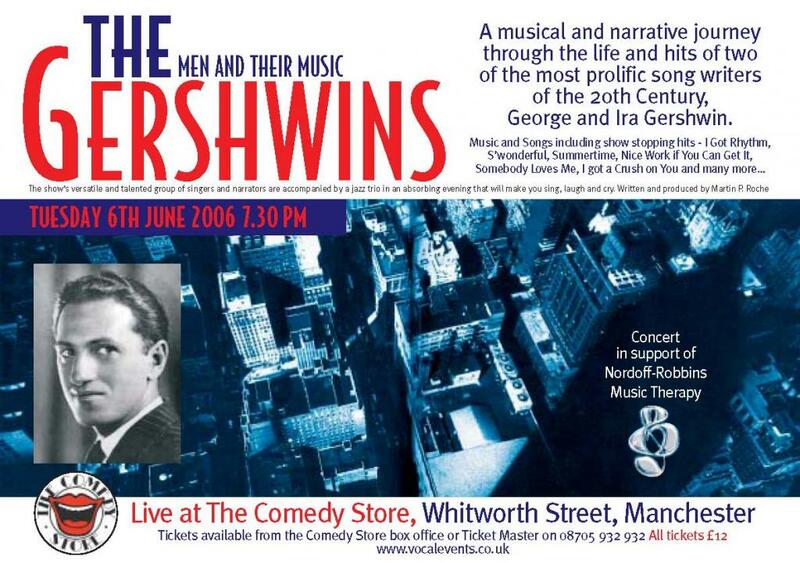 The Gershwins – the Men and their Music was first performed in 2003 at the Royal Northern College of Music having been written and produced by Martin Paul Roche. He donated the proceeds of this sell out production to the British Heart Foundation and Cancer Research UK. In 2006 he reprised that sell-out performance, this time in aid of the respected music therapy charity, Nordoff-Robbins with a group of talented local performers and musicians at Manchester’s own Comedy Store. It is written as a concert performance of the music of George and Ira Gershwin comprising narration and interpolated music performed by a rhythm band. The script is primarily based on research which encompassed many sources, but the primary reference was the writings of Edward Jablonski and more particularly, those contained within his book Gershwin Remembered. It is therefore only correct that the writer is acknowledged as the primary reference source and credited accordingly. However for the purposes of artistic presentation, it has been necessary on a very few occasions to make some slight amendments to quoted references. These are minimal. It is written for two narrators who lead the audience through the life and music of George and Ira Gershwin and in doing so, link together the songs which are presented. This is delivered in a very animated style, as the narrators take on numerous personae of historical characters that bring to life this extraordinary musical partnership. In doing so they and the singers bring recreate through song and sentiment the lives of the Gershwin brothers and those who shared this pivotal moment in the formative years of this intrinsic era in musical history. The vocals are provided by four singers covering a broad brush-stroke of the Gershwin catalogue which includes solos, duets and four part segued arrangements. It is a fascinating and absorbing piece of musical theatre and one which would suit any venue, no matter how intimate. The piece is now available to perform and further details can be obtained by utilising the contacts page. ... an absorbing evening of theatre which made you sing, laugh and cry ... loved the way it was presented. Highly original.